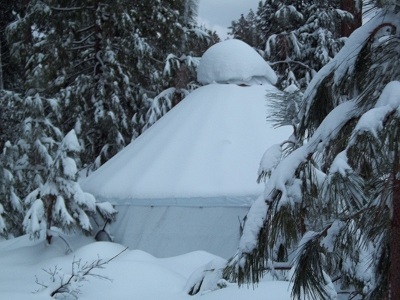 I have five yurts at my place in the Sierras. One is my sewing yurt, another a workshop for my large power tools like my table saw, joiner, band saw, sharpers and planer. Still another yurt is set up with work benches where I make yurt walls, doors, hubs and the rest of the woodwork. Two are used for storage and for frames to fit canvas before sewing. During winter I am working inside and summer I like to set up outside.